When it comes to all things Star Wars I always avoid spoilers especially when it comes to the movies themselves, however this was not the case when I made the trip to Ceann Sibéal in Dingle. (Don’t worry there won’t be any spoilers here!). It had long been rumoured that production for the latest episodic instalment of the saga would be returning to Kerry in 2016. And this proved true when set construction began on March of this year. I was still feeling the high I got when watching The Force Awakens with the icing on the cake being Skellig Michael appearing in the third act of the movie, so to hear that production was returning to Kerry and in particular Dingle, a thirty minute drive from my home, my excitement levels went into overdrive. I have been in love with this saga since I was about ten years old, my love affair with that galaxy far, far away first began with my viewing of The Empire Strikes Back on VHS in 1995 and was cemented when I went to see the Special Editions in 1997 and has continued ever since. (I often get asked which movie is my favourite and to be honest I don’t have one particular favourite. One day it could be Return of the Jedi the next it could be Revenge of the Sith!) I was collecting all the Kenner (now Hasbro) actions figures, vehicles and of course the lightsabers and I’ll never forget the days I spent swinging my Darth Vader and Luke Skywalker lightsabers around my back yard pretending to be on some ancient planet on the far reaches of the Star Wars galaxy, and even then thinking to myself this location would be a great setting for a Star Wars movie. Fast forward 19 years later and Star Wars is set to begin filming down the road from me and naturally I was not going to pass up the opportunity to check it out. 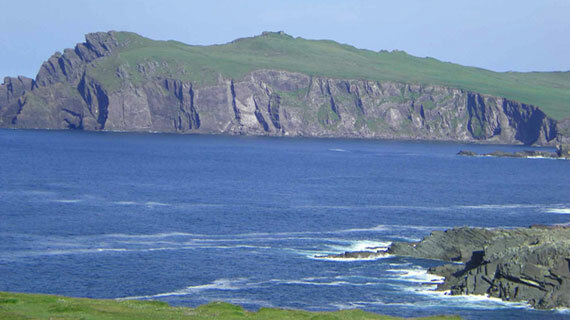 Production began on the Ceann Sibaél set on May 18 after stints of filming in Donegal and Cork, and lasted till May 24. My girlfriend and I decided to take a drive out on Sunday to see the set and get as close to it as we possibly could. We arrived in the village of Ballyferriter and off in the distance we could see the set, we drove through the village and got within a kilometre of the actual set, needless to say I was more than a little excited. We hopped out of the car to take it all in, of course as to be expected security was tight as there were plenty of other interested fans there with the same idea in mind. People came from all over the country just to take a look at the set, the atmosphere itself was electric. A Panavision camera truck drove past us and there was a lot of movement on the set, I had my binoculars out and was scanning the horizon feeling like Luke when he was looking for Artoo in A New Hope. I explained to my girlfriend that they were probably getting things ready for tomorrow’s shoot and pointed out the Pinewood Studios lighting and equipment trucks along with the camera choppers. I was taking it all in when I heard a voice over the PA system from the set saying “Ok let’s go for a second take”. I could not believe it, I was actually hearing Rian Johnson giving direction. For some reason I assumed that there would be no filming on Sunday but I was wrong and pleasantly surprised. For the next three hours, yes three hours! We took it all in, watching the camera chopper getting aerial shots and establishing shots of the area then hovering above the set to film a sequence, hearing Rian Johnson giving direction and seeing practical effects going off. Once this take was completed I saw the director and crew set up for a scene that takes place away from the main set, one involving some of the main players. I won’t go into detail on this as it would take us into spoiler territory, but suffice it to say I’m looking forward to seeing this scene on the big screen and we are in for a treat. Once this scene finished shooting, Rian Johnson told the cast and crew that it was a wrap for the day, as we were getting ready to depart ourselves, several Range Rovers containing the director and various cast members drove past us, again I could not believe who I was seeing! What a way to end our day! I had the same smile on my face as I had when watching The Empire Strikes Back for the first time back in 1995, the entire experience was surreal. It was incredible to watch a big budget picture being produced in the area where I live but the fact that it was Star Wars made the experience much more special. I got to watch the magic unfold before my eyes and I was filled with that childlike sense of awe and wonder that Star Wars brings out in us. My mind flashed back to my childhood days of pretending to be a Jedi Master in my back yard with my lightsaber only I wasn’t in a back yard I was on some ancient planet in the galaxy, who knew that several years later it would turn out to be Ahch-To. When it comes time to sit down in the theatre and watch Episode VIII, and when some of these scenes play out, I can say we were there that day! Side note, I would like to thank my amazing girlfriend for her patience on the day as we did spend three hours on location! You can find Paul on Twitter @PaulLoughlin5. I wish Star Wars was filming near me. I’d be begging everyone on set for a part. What an absolute treat for you and your girlfriend! 🙂 (She is a Star Wars fan, isn’t she? 😉 ) It sounds like you had an awesome time, and I hope you have a car load of special memories that you can revisit as often as you like. It was a really special day as you can imagine, not in my wildest dreams did I ever think I would have this experience! When I first met my girlfriend she’s wasn’t a Star Wars fan but I’m glad to say after a viewing of the movies that changed! This is an experience I will remember for my whole life, if I thought Star Wars could not get anymore special to me I was wrong! To be honest it still feels surreal. Glad to hear you enjoyed your trip here and now you’ve an extra excuse to return. 😉 definitely does not get much better than that! Thanks for taking the time to read my tale, I really enjoyed writing it and it’s been both an honor and a pleasure to share it here on the site.